If you dream of leaving behind the tedious routine of life, the boredom of a job, the constraints of a daily routine and wish to discover a simpler way of life, in harmony with nature, in rhythm with the world around you, breathe air that is clean and free, meet people from other cultures and explore far flung places our flagship adventure rides are for you. 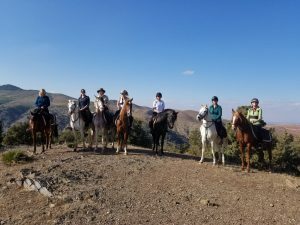 These rides can be physically challenging: high altitude, long hours and fast changing conditions, requiring an adaptable attitude, a level of fitness and good sense of humour but in return you are one of the privileged few to travel through truly remote and breath-taking scenery and be welcomed by fellow horsemen in little known cultures. This type of travel is reserved for intrepid travellers and explores routes followed for thousands of years by tradesman, warriors, pilgrims and explorers. Ranging in length from one week to one month and covering every continent on these rides aptitude for adventure is far more important than technical riding ability and many itineraries are suitable for bold novice riders onwards. We have rated our adventure levels 1-4. This indicates how "different" a ride is from riding at home. This includes physical challenges such as high altitude or long hours in the saddle, cultural challenges such as language and meal times or different ways of doing things. Increasing adventure levels require increasing flexibility. For a more relaxing experience pick levels 1-2, to experience something different pick 3-4. Rides listed below all fall into the 3-4 category and are listed by continent/country/alphabetically. 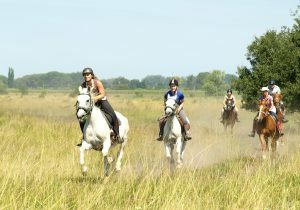 Level 1 Like riding at home, rolling countryside, full service, everyone speaks English, similar standards and comforts to home. Level 2 There may be language barriers or different ways of doing things, still quite comfortable but with different standards from home, may be unpredictable parts or some rugged terrain. Level 3 Different accommodations, attitudes or methods of riding are used, may have challenging terrain, long days or itinerary changes, may involve camping or not so comfortable accommodation. An appetite for explorations and new experiences is required. Level 4 Extreme adventure, very challenging terrain and possibly extreme or fast changing weather requiring adaption of itinerary, must be flexible in attitude, good humoured and fit.